CORNWALL Ontario – At the request of the Cornwall Police Service Friends of Vets President Gary Samler announced that their event will be postponed. 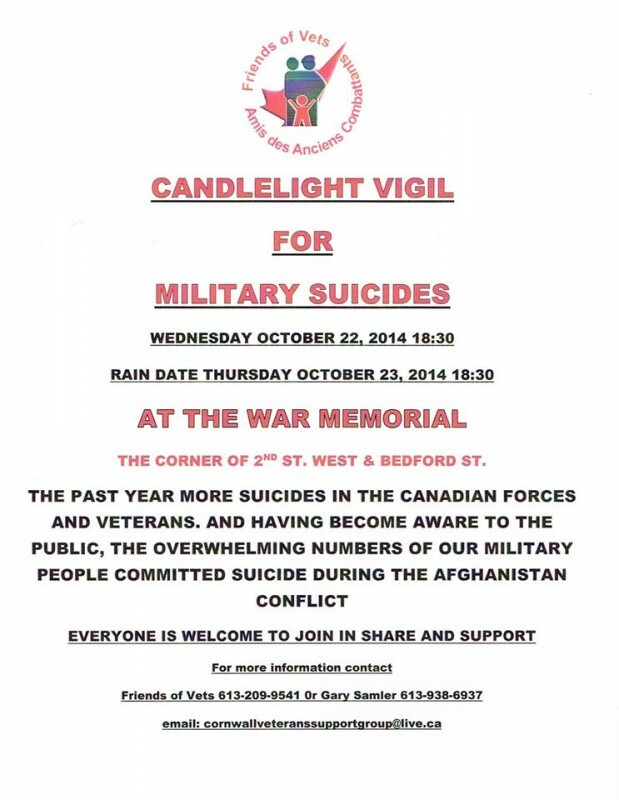 It had been scheduled today, the 22nd, as a symbolic gesture matching a number of suicide victims from PTSD; but after events in our Nation’s Capital and warnings for Armed Forces to not appear in uniform, the event will have to wait. Two people have been confirmed dead during this morning’s shooting including at least one of the attackers. I will advise to all when a new date is confirmed to hold our event So sad to hear about todays events in Ottawa this morning. Mr. Samler this is a terrible tragedy and this came from a home grown terrorist who is half Arab and half French Canadian and they are the worst kind. I heard that this could happen from my husbands newspapers and Canada was on a list for attacks as well as Australia and elsewhere. Australia’s Parliament is in danger and I fretted for our Canada since we have plenty of those people here even in my area. The home grown are the worst because they are harder to detect and many Canadians, Aussies, Europeans, etc. change from Christianity to Islam.